Size : 15.8 x 16.7 mm. Weight : 2.38 grams. Grade : gF/F but struck on a small flan, some dark toning due to horn silver deposits. Obverse : Head of Commodus right, with L AEL AVREL COMM AVG P FEL around (due to the small flan the last part of the inscription is off the edge). 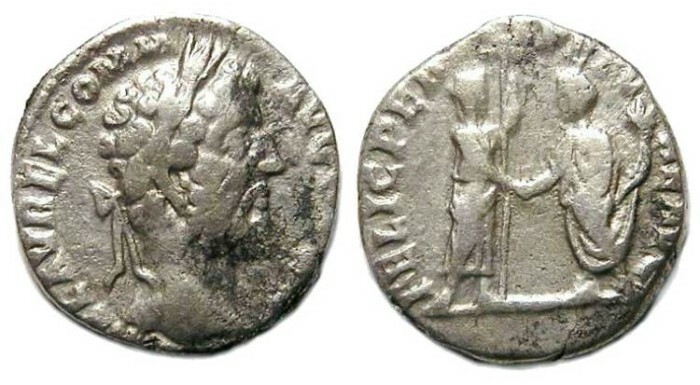 Reverse : Commodus standing left, holding a cornucopiae while clasping hands with Felicitas who holds a long caduceus, with FELIC PERPETVAE AVG around (the tops of some letters are off the flan).